The Venezuelan regime and their allies in the Castro regime continue to escalate repression. Thousands of Cuban military advisers and intelligence officials are assisting the Maduro regime to further consolidate power to entrench the dictatorship in Venezuela. The OAS Secretary General described it last month as "being like an occupation army." The Castro regime's personnel have been training the military, security services and pro-regime militias in tactics and strategies to terrorize and repress the citizenry in Venezuela. On May 18, 2017 The Miami Herald reported on a recording of a Venezuelan general advocating for the use of snipers against street demonstrators "in the future." 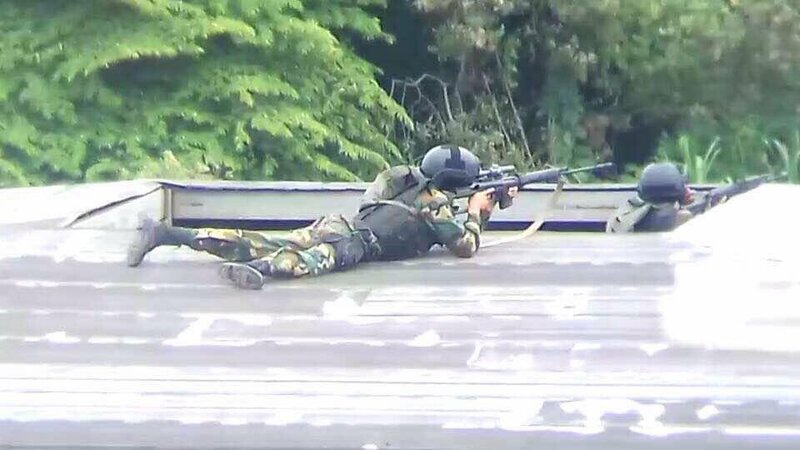 Maduro regime snipers were spotted this past Sunday, August 30th on roof tops shooting peaceful protesters in the head. At 4:29pm Blanco tweeted: "Adrián Rodríguez (13) was assassinated in Capacho, Táchira. Army sniper shot him in the head from the roof of a school." 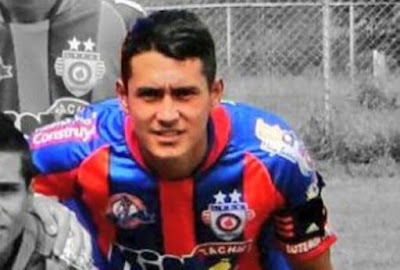 At 8:18pm he tweeted: "Ender Peña died (18), shot by bullet during protest in Táchira. Transferred to a polyclinic, he didn't survive the operation." 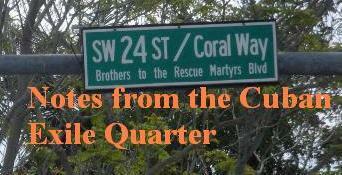 A few minutes later at 8:36pm Blanco tweeted: "Conflict escalation is very obvious. Weeks ago military fired tear gas into the chest, now firing with rifles to the head." "With the seriousness and responsibility that characterizes us, we share the following position to public opinion: Following the illegal suspension of the process of the realization of the recall referendum, ratifying the absence of independence of the powers in the country, the government of Nicholas Maduro should be described as a dictatorship. On July 27, 2017 the Minister of the Interior, Justice, and Peace, Major General Néstor Reverol, announced the prohibition throughout the Venezuelan national territory of "public demonstrations and meetings, concentrations of persons or any similar act that may disturb the normal development of the electoral process"
On July 16, 2017 over seven million Venezuelans voted in a non-binding plebiscite rejecting the Constituent Assembly of the Maduro regime. A general strike was successfully carried out and despite regime violence and a prohibition to protest Venezuelans still took to the streets in protest. 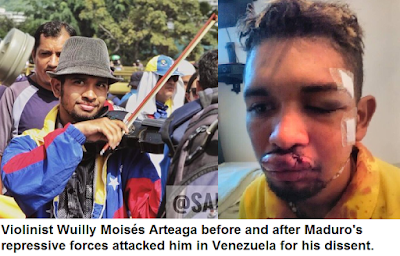 Wuilly Moisés Arteaga, a young man playing the national anthem with his violin, was told to shut up and was shot in the face last Saturday. From his hospital bed he said that he would return to protest in the streets, and he did. He was arrested on Thursday, July 29th beaten up and tortured for protesting against the Maduro regime to the degree that he has lost hearing in his right ear. Despite threats of reprisals from the Maduro regime for those who did not go out to vote only 12.4% of Venezuelan voters took part in the sham election and 87.6% abstained from taking part in ratifying the dictatorship. The international community has reacted negatively to the carnage in Venezuela and the dictatorship there. 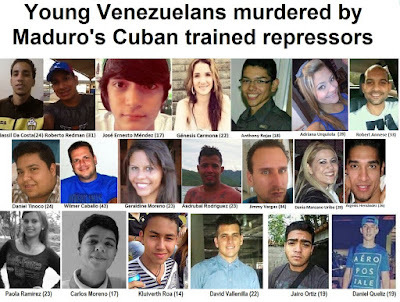 The Castro dictatorship that has helped to install it denounced "the initiation of a well-orchestrated international operation, directed in Washington ... to silence the voice of the Venezuelan people" while celebrating the fraudulent election. Venezuelan citizens spoke out by the vast majority boycotting the vote this past Sunday and brave souls taking to the streets to protest, despite the presence of snipers that permanently silenced some to terrorize many. The Maduro regime's election officials claimed that 8.1 million voted in their sham election, but Smartmatic, the company that provided the voting machines issued a statement that the turnout numbers had been tampered with. 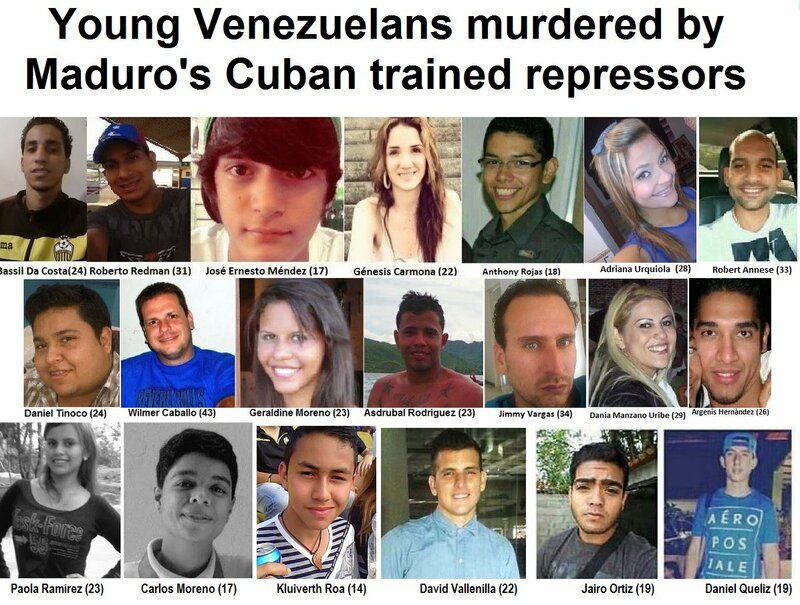 On Sunday there were 16 indiscriminate murders of citizens who protested against a fraudulent election and the installation of an illegitimate national constituent assembly. Today there was the selective targeting of opponents. The regime is trying to silence Ledezma and López and, through them, silence and subdue an entire people. It is no accident. They are opposition political leaders in a framework of the social, political and economic crisis of a Venezuela that is suffering to return to democracy. There are no legal rationale for Ledezma and López to be in jail. The Castro and Maduro regimes are working over time to silence Venezuelans and impose a totalitarian dictatorship in Venezuela.